No it’s Portmadog 2010 and even the absence of Ford Cortinas cannot hold back thoughts of the three day week and drawing boards, pounce, rubber fights and smocks. What is now the gentrified South Snowdon Wharf was the slate harbour when in the 1970’s Francois Sperry and Sir Bertram Clough Williams Ellis both eulogised our brave designs; gradually public affection followed this brutalist scheme from ‘New York’ to chocolate box. The residents love it – all very different from when PCPT built it when our office PABX was jammed by nationalists and odd packages were arriving in the post! Nowadays some of the greys and sepia render colours are getting close to Tobermory – Suffolk Pink, Coventry Blue – but apart from the odd plastic door and window, it remains for me 1975 and the year of my wedding in Portmadog. One of the privileges for PCPT is our longevity and the delight in revisiting vintage schemes like this masterpiece. It reminds us of how a design ethos can be maintained or, like the football manager’s selection mantra, ‘form is temporary – class permanent’! 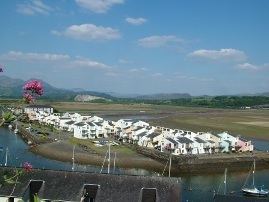 So it was an especial delight when Susan and Richard asked us to extend their beloved holiday home in the harbour. A lot of time went into the form, profile and ways of incorporating something contemporary into something so new but irony of irony it is not the design that has challenged us but, because the development is now so precious, everyone wants a say. I hope we do not have our iPhones blocked or email tampered with!